An O'Neill Cylinder. An example of a future space colony. Let’s assume that humans survive the next few hundred years without destroying ourselves, or the planet, and we actually become a space faring civilization. What kinds of challenges will we face, and what projects will we build to expand ourselves out into the Solar System and eventually the galaxy. You just need to think big. From the *interesting* files: We Must Move the Earth Now! Fraser: I’m doing very well. So let’s assume that humans survive the next few hundred years without destroying ourselves or the planet and we actually become a space-faring civilization. What kinds of challenges will we face and what kinds of projects will we build to expand ourselves out into the solar system and eventually into the galaxy–we just need to think big! Alright Pamela, so what would you say the future holds? Now let’s assume, right… we’ve talked about all the ways that we could kill ourselves and the universe is trying to kill us, we’ve got global warming, we’ve got diseases, we’ve got asteroid strikes, you know, mega solar flares, wandering black holes… there’s so many ways to die. But, let’s assume that we make it through that turbulent period and actually move ourselves into the process of becoming a space-faring civilization, beginning to colonize the solar system. What are some of the kinds of projects that some people have thought of that we might be able to build to support that? Pamela: Well, I think two of the first real super-giant huge in-space structures that we’re likely to see are, first of all just a colony on the moon. It will probably start as the equivalent of a trailer park on the moon, something built down, hollowed into the sides of craters or… the thing that we’re looking for most is a lava tunnel… underground that was left behind as the cool crust of the magma stayed behind while the hot rest of the lava continued to shoot across the surface creating a tongue of lava somewhere else. We want to be underground, and our first mega-structure is likely to be built roughly under the surface of the moon. Fraser: So we can imagine sort of as we move towards building that moon base we’re going to be launching up, as you said, trailer after trailer down onto the moon, connecting them together, and eventually humans are going to decide, well… it’s time to stay. So they’re going to dig down into the moon regolith and actually build something underground… I guess excavating out a lunar base, something permanent. Pamela: And this isn’t the most exciting type of structure any of us have ever imagined, you always want to see the big, shiny dome with the skyscrapers underneath the big, shiny dome. That works great in a George Jetson universe, but the reality is we have to deal with radiation. But, if we ever figure out how to deal with radiation without requiring dirt, water, earth… something between us and the solar wind… if we can make that breakthrough, suddenly the doors open to create much more exciting mega-structures. Pamela: It will kill you..
Fraser: But how does that affect… like as you said, you build some great big space station… what’s the problem? Pamela: In general, they type of stuff you build a great big space station out of… you’d want to have some sort of membrane, something that inflates like the inflatable domes you see covering some football parks. That sort of membrane, that sort of flexible material… we don’t currently know any that’s capable of blocking high-energy particles, capable of blocking radiation, capable of blocking the type of stuff that is shooting through space every moment of every day looking for a piece of DNA to tear apart and cause cancer. Fraser: Right, so if you lived in a big balloon, you’d have the air pressure that you needed to breathe and against your skin so you’re not getting space bruises, but it’s the radiation… and I guess if you’re out there for long periods of time you’re eventually going to get hit with a solar storm, proton storm coming from the sun… which could deliver a lethal dose in just a couple of hours. Pamela: The Apollo astronauts were extremely lucky. We managed to have this wonderful window where the sun was quiet while the astronauts were on the moon. Had we not been so lucky, we could’ve lost some astronauts to the radiation. Now here on the planet Earth, we’re protected by our own magnetosphere. We’re protected by the wonderful magnetic field that comes along with the north and south magnetic poles that allow us to navigate. The moon doesn’t have that sort of a magnetic field. In fact, if you get high enough up in the Earth’s orbit, you don’t have enough protection in orbit, either. The astronauts are mostly, but not entirely protected, because they’re so close to the planet Earth. But, people are working every day to try to develop artificial ways to create magnetic fields that are light enough, that are low enough energy drawing that it might be possible to start to protect spacecraft, to start to protect space structures with artificial magnetic fields. Fraser: But don’t you also suffer the problem of not having any gravity? I know that the astronauts living on board the space station… their muscles and bones start to waste away if they’re not experiencing any gravity. And exercise can help, but it doesn’t solve the problem entirely. Pamela: Right. This is another long-term problem. But it’s also a problem that lots of sci-fi writers have started to find solutions for. Now, hanging out on the surface of the moon, you can’t do too much. One solution that’s been proposed, that sounds rather horrific to me, is you sleep in a centrifugal chamber where you sort of imagine going to bed in a carnival ride where you’re in a giant drum leaning up against the wall, and the drum starts to rotate, and eventually you’re experiencing one Earth gravity or more. It might be a comfortable way to sleep, I know I managed to fall asleep in one of those rides at Space Camp once as a kid, but I’m a bit twisted. It’s a solution… but it’s not a day-to-day solution. Fraser: Right, now rotation, though, I think is the key, right? Pamela: Yes. So while on the surface of the moon it’s kinda hard to build a structure that’s big enough to work in that’s rotating… that same limitation doesn’t exist when you start building space stations. And here there’s some really neat designs out there that go beyond just Babylon 5 and the space station from 2001 where we start imagining what, to me, look kinda like giant hamster habitats rotating in space. But if you build a large enough tube and set it rotating at an angle to the sun, you can have such that the inside part of the tube experiences daylight for part of the day, and is in shadow… is in its own shadow as it exposes the outer part of the tube to the sun for another part of the day, creating a natural day/night cycle for people living in this partially transparent tube. Fraser: Whoa… ok, so, hold on… I’m kind of imagining a toilet paper tube, right? Pamela: Well, think more donut in space… but a hollow donut, like one of those hamster trail things that you can get. Fraser: Right, but you’re living inside it… on the inside edge of this gigantic cylinder. And it’s rotating at the right speed so that you’re experiencing the equivalent of Earth gravity, and at the same time it’s angled so that part of it is in the shade and part of it is in the sun. Then I guess you would cap off the ends of it so that all your air doesn’t get out. Pamela: Right, so… well, here’s a good way to think of it. Take one of those completely round hamster trail tube things that if you set it on the floor, you can watch your very disturbed hamster running infinitely in circles and circles and circles. Now, take that completely clear tube and roll it like a wheel through paint, so the outer half of it is completely opaque. Now, instead of having paint there, imagine this entire habitrail is something the size of an orbit around the earth. Pamela: And where that paint is, is where earth is… where dirt is… where structures are. And where it’s transparent, well, that orbiting structure is transparent as well, and that’s how the sunlight gets in. Now you take this donut-shaped… this tube that has on the outer rim earth and buildings and structures, and put it at a 45 degree angle to the sun. Well, the inner part of that donut, that tube, is going to get sunlight coming into it during part of the day, but then it’s going to rotate so that the sun is blocked by the dirt so that the sun is actually underground behind your feet for the other part of the day. So you can build something… in fact you want to build something big enough that as it rotates you can have earth gravity, but also as it rotates you can have a 24 hour day/night cycle. Fraser: Right, but building a structure the size of Earth’s orbit sounds a little complicated. Pamela: Yeah, you need to go grab yourself a good asteroid and start mining madly away. But, it’s possible. It just takes time, technology, and money. And it’s mostly the money and the ability to stop radiation that we’re lacking right now. Fraser: And you could imagine, then, a structure like that, just having an enormous amount of surface area for people to live on. Pamela: And also an amazing ability to collect solar energy. We are starting to reach the point, technologically, where we can build transparent and semi-transparent solar panels. So you can build a structure where everywhere you have a window, you’re also gathering energy. Since you’re building the entire thing from scratch anyways, you can also put opaque solar panels all along the outer rim, the part that’s going to be opaque anyways because it’s covered in dirt, of the structure. So you can build this as a giant energy collection system. It’s a pollutionless form of energy. You can now have a completely electric society that isn’t doing any harm to its completely enclosed atmosphere other than whatever harm comes from having cows that do cow-like things, or other life forms that do life-form-like things. Fraser: But in theory if you build something that ginormous you can handle the implications of the life forms that you’ve placed inside of it. Fraser: So like there’s the Ringworld story… is that kinda what we’re talking about? Pamela: The Ringworld is exactly the type of thing that we’re talking about. Except you can do this on two different scales. What I’m talking about is you build something that you can imaging the entire donut orbiting in a happy-go-lucky way in place of a planet around a star. Fraser: Right, I see… so it wouldn’t be ringing around the sun at the distance of the earth’s orbit, it would just be sort of floating in space in the same kind of place where the earth is going. But it would just be rolling around the sun as opposed to surrounding the entire sun… so you could make these as big or as small as you wanted, right? You could make one, as you said, as big as the earth, you could make one as big as the moon, as long as you get the… you could make one a couple hundred meters across… there would be some minimum size where the rotational forces would make you sick to your stomach, right? Pamela: Well, as long as you do the rotation right, it’s always 1-g. The problem is making the 1-g area wide enough that you can survive it, and tall enough that your head and your feet don’t have radically different gravities. Fraser: That’s right… yeah, I know that’s the problem, right… people talk about these rotational strategies for dealing with gravity where… but what you don’t want is where your feet are feeling one type gravity and your head is feeling a different amount of gravity because of the different rotation speeds. Is there some size where that sort of goes away? Pamela: Yes. And it’s not that bad of a size. Babylon 5 did all of their calculations right, Arthur C. Clarke did all of his calculations right. So, this is something that is a buildable size, that’s a feasible size, but what’s not as feasible but is still imaginable–not feasible today, but maybe in the future–is starting to build Niven’s ringworlds where instead of having a regular donut inclined to a sun, happily rolling around… rolling around the solar system… Instead, you just build a ring around the sun. Fraser: So essentially, you’ve then got Earth everywhere around the entire orbit around the sun. Fraser: At the earth’s distance from the sun, it’s just planet. But instead of it being a round ball that goes around the sun, it’s just a flat ribbon that goes all the way around the sun. So, then what’s involved with that? Pamela: Here again, you see in websites and in science fiction this is often described, like you said, strictly as a ribbon. But you actually need to build it as a domed ribbon. Because otherwise the atmosphere will escape. People talk about… well, if you make it big enough you’ll have gravity… no, if you make it big enough… gravity always points towards the center of mass. Fraser: Won’t it just turn it into a sphere? It’ll try to, right? Pamela: Well, it will eventually gravitationally collapse under its own mass into a sphere. But, ignoring that structural building problem, if you make the thing massive enough, gravity always points towards the center of mass, so you’re not going to be attracted to the outer ribbon of this thing, you’re going to be attracted to fall straight into the sun, and that’s a bit of a problem. Fraser: And you give it a rim, and then the air, just like people, is experiencing that 1-gravity. The air can’t get over the edge of the rim, so it sticks around inside the ribbon, just like the people do. Pamela: The problem starts to be that gases collide with themselves, they’re getting berated by the solar wind, you run into all sorts of problems that will cause, over time, the atmosphere to drift away. Fraser: Right, it’s very different from escape velocity. Pamela: And so now it’s a much more complicated system where you will lose your atmosphere, and it’s something to be concerned about. So the easiest way to prevent that is you just put a lid on the whole darn thing. Fraser: So, build a big dome… so it’s a ribbon with a dome facing the sun. And I guess then you can also put in your shielding because you’re going to have that same problem, right? You’re not going to have the magnetosphere to protect it, and so it’s almost like somebody somewhere is always going to be getting blasted with protons. Pamela: Right. The other problem with these is that they’re not actually all that stable. Here with our planet Earth we’re always, quite literally, falling towards the sun. But, we have enough velocity that we are falling at the same rate we’re orbiting, which sounds really confusing. The way to think of it is… if I throw a rock, it arcs down towards the surface of the earth. It falls. But, if I throw that rock hard enough, it’s going to be able to get from me here in Illinois all the way to you in Vancouver before it falls and hits the ground. If I throw it even harder, it’s going to make it curving around the surface of the planet all the way to China before it falls. I keep throwing the rock hard enough, it’s going to make it all the way to friends in Britain before it falls. Fraser: Right. Eventually it’s going to bonk you on the back of the head. Pamela: Eventually it’s going to bonk me on the back of the head. And if I duck, it’s orbiting. Pamela: Now, it’s that velocity that it has that keeps it orbiting. Well, if you have a solid ribbon, it’s not really experiencing a forward velocity. It’s just a stationary object that happens to be rotating about its center of mass. So the only thing holding that Niven ringworld in place is, well, it’s gravitationally attracted to the sun and it’s stopped falling. It just happens to have its gravitational center and the sun’s gravitational center in the exact same place. But, it could become unstable very easily, and it could end up rotating in strange ways. Lots of bad things could happen, so you actually have to have stabilizers on this thing. Pamela: Or that it doesn’t inadvertently start rotating about more than just the central axle. You can imagine it rotating like a bicycle… that’s a good thing… where you have the axis straight through the center, the ring is perpendicular to it, it’s going around and around and around… life is good. Now imagine coming up and biffing it from the top so that it’s now the entire ring is rotating around and around and around like a top on its end… that could be bad on many, many levels. Fraser: Well, I think the initial impact would be bad… Now is there mass… is there material in the solar system to build something like that? Pamela: The calculations that I’ve seen basically say that if you sweep up all the mass, all the mass… all the asteroids, all the planets, all the plutinos, all the Kuiper Belt objects, sweep up the Oort Cloud… yes. Pamela: And melt the stuff that’s not, so that you can make the atmosphere that you need. Pamela: Well, we need its mass, also. Fraser: Might as well chew it up for fuel… but, I mean what we’re obviously talking about here is the ability of future civilizations to actually completely control the mass and matter in their solar system, right? Pamela: Right. And it’s the energy that in many ways is the real reason for starting to build these things because again, with the Ringworld, you’re able to start capturing a whole lot more of the sunlight simply because you’re now exposing a whole lot more area to the sun. And as you start to build more complete enclosures around a star, you start to be able to capture more and more of its energy and do more and more interesting things. We’ve all seen in Star Trek or in other sci-fi movies where they start talking about Dyson spheres–completely solid spheres enclosing a star. And while they have the same stability problems as a Ringworld, they also aren’t as feasible to build because they require a whole lot more mass. But, if you were able to build one, you could then capture and utilize all the energy from a star. Fraser: A hollow ball, and you just clamp it around the sun. And you’re now extracting all of the energy that’s pouring out of the sun. Pamela: Other slightly more feasible ways of doing this are brought up all the time. Instead of creating a new surface on which to live, keep the planet Earth… we kinda like it. We may not like it eventually, but right now we kinda like it. And instead build a swarm of light collectors–a Dyson swarm. Encase the sun in these small moving orbiting objects that are hopefully not colliding, but are all scooping up light from the sun and either beaming or otherwise getting that energy back to the civilization that needs it. Fraser: So you could imagine that you take this swarm of solar collectors, move them in to like maybe the orbit of Mercury, so that they’re very… receiving a very strong amount of radiation, and you configure them so that they’re all collecting sunlight except for this little spot where you let sunlight pour out and hit the earth. We wouldn’t even be able to barely tell the difference, right? I mean, we’d look at the sun, and there’d be the sun in the sky and you wouldn’t even see that there’s a big cloud of collectors…. Fraser: They would be very bright… yeah, no, absolutely. But the point being that you could still have your Earth and still have your sunlight, and then of course as the sun gets warmer, you’d just be collecting more sunlight and, of course, you could keep moving the earth further and further away if you wanted to. You could get all your benefits… you could still live on Earth and have free energy for everybody. 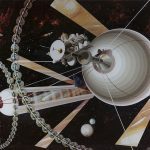 Pamela: And taking this a step further, one of the coolest ideas that I think I’ve read about is a type of stellar engine where you actually start moving the entire solar system. Pamela: Instead of worrying about building generational spacecraft, you just move the whole solar system to go exploring. The way you do this is you build a GIANT… a GINORMOUS solar sail, something that is able to block a substantial amount of the sun’s light from going off out into space. You place this giant solar sail such that it’s exactly balanced between its gravity pulling it in–it’s mass and the sun’s gravity pulling it in toward the sun, and the radiation pressure on it pushing it out towards the rest of the solar system. Pamela: And this giant solar sail is now preventing the radiation pressure from going off in other directions, and is effectively acting to unbalance the forces. Fraser: I see. Let me see if I understand it correctly… so the radiation pressure is hitting the solar sail and so it’s causing the solar sail to move away but you figure out a way to make sure that the gravity of the solar sail keeps pulling the sun forward. Pamela: It’s actually its radiation pressure is doing all this pushing and that radiation pressure being unbalanced because it’s being blocked in this one direction. That unbalancing of the radiation pressure in all directions is able to allow you to start moving the solar system. Fraser: “And our own sun!” You know, just to show that we’re good guests. So you could then, with enough time, and we’ve talked about how the universe has trillions and trillions and quadrillions of years to go before we start to lose stars, that you could imagine some really advanced civilization eventually moving all of the stars in their galaxy around to wherever they want to put them. Put them in a big ring… put them in a big ball… mash them all together into the super-massive black hole in the center of the galaxy and harvest the energy… can you harvest energy from a black hole? Fraser: Right, right… so you drop stars into the super-massive black hole and then harvest the energy that pours back out, right? Fraser: Right, right… because if I recall correctly, energy coming out of a black hole is actually a very efficient form of energy. Fraser: Right, you’re getting almost pure energy coming out of that. Pamela: You’re getting all sorts of different energy coming out of it, but what is good is the accretion disk is able to convert a fairly significant amount of the mass into thermal energy of all sorts of different types, and this gets radiated away as light. Fraser: It’s just time on your hands… we’re not having to come up with any new methods of time travel, or faster-than-light speed, or any of that… as long as time time’s on your hands, and you’ve got a big plan, you can move stars. Pamela: And this is the perfect type of plan for someone living on an itty-bitty little red dwarf. You’ve got a few trillion years on your hands, you have a planet with a nice stable civilization, you all love one another… You can start to, in this case, start to make the many-generational plans. With our system, our sun doesn’t have that long left, and you can’t really get these suckers going that fast. Fraser: Yeah, and I think that… although this sounds kinda like insane navel-gazing, you know… run out of interesting things to think about, so let’s think about, you know, really crazy stuff. But I think that there is a real purpose to this which is that thinking of the kinds of things that future civilizations might do to manage their civilizations gives us something to look for from Earth… which is that each of these things that we’ve talked about is gonna have a radiation signature… it’s going to be instantly obvious… if you find it. Fraser: So, could you explain that a little deeply? Why would we see an excess in the infrared? Pamela: So, what ends up happening is that these happy little energy collectors… they’re collecting energy across the entire electromagnetic spectrum. Blue light–take it! Red light–take it! They absorb everything… gamma ray, x-ray, it’s all theirs for the collecting. These higher energies aren’t going to make it all the way through the collector and come out the other side. They’re just going to get absorbed, they’re just going to hopefully get converted mostly into energy if you’ve got good efficiency. But the entire structure is going to heat up and heat is the same thing as infrared light. So you have these collectors gathering light, gathering light, gathering light and then that’s on the front… but on their backside they’re going… oh, going to be hot and radiate away infrared energy. So, they’re accepting the blue, accepting the red, and only giving off the infrared. That causes an excess of infrared where you wouldn’t normally have it. Fraser: Right, so there would actually be a fairly interesting energy signature of a star like that. Fraser: You theoretically should be able to detect even with the kinds of telescopes that we have today. Pamela: It just takes high resolution… well, it doesn’t even take that high resolution spectroscopy, it just takes broad wavelength spectroscopy, very careful analysis, and it has to be very high accuracy because it’s not going to be a lot of an excess, but it’s the type of thing that people are thinking about. Fraser: Right, and then once again with the solar sail idea you would, you know, be able to detect a… again almost a reflection off of this. Pamela: Right, so, you end up seeing this very weird infrared signature that is clearly the equivalent of a hot rock rather than a hot star. And what’s interesting is because these things are so big spatially, even compared to the surface of a star, it starts to get to the point where once you find one of these suckers, if they exist, if there’s aliens, if there’s other civilizations nearby… many, many ifs. But if… then you can start to go oh, let me resolve that because we have the technology. Pamela: Yeah, we don’t know of the perfect absorber. Fraser: Right. It’s gonna leak out energy in the infrared spectrum and it’s something that would have a very tell-tale signature and we would be able to spot it. That’s the part that is very interesting… it’s another vector, another way for us to search for evidence of alien civilizations. We’re looking for life in the solar system by grinding rocks on Mars, we’re listening for signals from other worlds, and this is another way that perhaps we can search for other civilizations… to look for these specific megastructures out in the universe. That’s really cool. Pamela: And even if none of them exist, maybe we’ve provided someone with fodder for next year’s NaNoWriMo. Pamela: It’s the “write a novel in one month” competition that’s out there. Fraser: Oh, there you go… yeah. There’s your idea… give us credit. Alright, well thanks a lot Pamela… that was really cool. Pamela: OK, sounds good Fraser, talk to you later. The tube description was kind of unclear (tube vs donut), but it sounds like a wheel-style space station, on a huge scale, with a sunroof and perhaps a 24-hour rotation rate to enable a passive day/night scheme. Hey, did you guys catch this? man your shows are really slackin… still good to see your still around tho 🙂 sweet episode! Just discovered this podcast, and I’m totally in love with it. Great, insightful episode. Even if we could muster the energy required and construct the implements necessary to “harvest” all the matter in the solar system, as Pamela said would be needed, there’s one thing we can’t get around, it seems: All the angular momentum in the orbits of that matter. It’s strictly conserved and the only way to get rid of that angular momentum would be use it to eject a good bit of the matter you need from the solar system. I loved this episode and the Nanowrimo plug at the end topped it. When I started my last Nano story I had to decide between two ideas I was working on. Either, the inter galactic battle base, (which I have since changed intra galactic… inter galactic travel is too absurd for even my imagination.) which was a huge tube spinning through space….and the other was a story about Earths decedents on the moons of Jupiter, 500 million years in the future (with lots of really bad science). I’m saving the Battle Base for this year’s Nano. Every episode sends my mind spinning in all kinds of directions, both plausibly and absurdly. Here is the latest episode of Astronomy Cast: Not on the homepage yet. It is in uncompressed .aiff format so the file is quite massive (315.77mb to be exact). Furthermore there is a surprise after the outro. Enjoy! Nice hacking. Please don’t post the links to uncompressed episodes. That makes us have to pay for 315 mb downloads. That’s how we transfer them between me and Pamela. I just became overexcited to find something not yet released like that. It was weird really I was looking for a working link of episode 25 so I thought maybe libsyn have a good link (I have done this with another podcast I listen to). By chance the only time I visit that site is when I find the latest unreleased episode on there, only posted an hour ago! I wanted to share it with fellow enthusiasts who maybe wanted an early fix and at the same time I was deeply curious about what it was and what it was doing up there. I assume there was some mistake and it wasn’t supposed to be published on that libsyn site? Costs never came into my head, sorry about that. Yesterday while I was listening to one of the older podcasts you were talking about donations and I was seriously considering it thanks to the quality of your work, please continue with it, the audio equivelant of the Cosmos series no less! Now after my shenanigans I am obliged to donate a few bob, definitely worth it.